Okay, we made it. It’s our last few days in Bali and admittedly we’re all equally ready to get out of here. Yesterday my six year old asked me when the next plane ride was going to happen. My 5 year old wasn’t far behind with the follow up statement, “I miss staying in a nice house like a hotel.” Of course she was referencing the First World commodities that our team is beginning to miss. It’s not for the paucity of beauty or culture. It’s not for deficit of experience or even because of poor accommodations. Indonesia was our first countries together as a team of four on this wild ride and we have spent exactly a month here. I could spend an hour typing up a list of all the ways we are functioning or giving you a fun tourist friendly travel blog but I am not going to do that. I’m going to take the liberty of assuming that I know you my fellow Searchers and break it down realistically. So here it is, in no specific order. The down and dirty, the nitty-gritty, the actual and useful truths that we experienced from our first of many months on the ground. “Again?! We fix? !” I can’t help but feel like this is the kind of information that should have been relayed in the brochure for this place. Needing to shake it off I head out with the crew for a jazz night in town hosted by an artist with rave reviews from the (Bill) Clinton administration. While awaiting our food we peruse a local newspaper where, what to our surprise would catch Adam’s eye but, an article titled, “Blogger dies from electrocution in shower!” What in the actual F**k?! At what point does this become an epidemic that the board of tourism feels is a notable mention? I’ll admit, we did choose to stay in Air BnB as a way to live a little more like the locals do but where the hell is the heads up for this OBVIOUSLY reoccurring problem?! The underlying irony being this, anyone that has ever met me or that knows a fraction of my story knows that I have lived through my fair share of close calls and would-be deaths. I am certain that my demise will come at the hands of some random and almost hilarious scenario not unlike the one above. So this one felt a little too close to home and I was audibly grateful for my squeaky clean escape *pun intended*. So there it is, Electrocution in the shower, Must Know #2, arguably a Must Know #1 for my book. Must KNOW #3, The houses are NOT SEALED and the “rodents” are better considered as family pets. When I went to Iraq I heard all of the same rumors that everyone else heard. One of the most familiar rumors that come to mind was that of the camel spider. You hear about how it’s as big as your head and can take an actual bite out of you. In reality it is a large spider but it’s no where near as large as your predecessors would lead you to believe. Hear me clearly, that IS NOT the case in Indonesia. They are ALL “that big.” House number 1 was built with a 1 foot gap between ceiling and roof which allowed for 2 foot reptiles to cohabitate with our family. We would wake up at 2 am to spiders the size of a saucer running across our ceiling. Ants were less of a nuisance and more of a pet in spite of the avid use of ant spray to the entire home and patio. We never ended up ant free but we may have very likely contracted some sort of Agent Orange equivalent while attempting to rid ourselves of their company. Let’s just say that there is a reason, that one foot gap, that the first house offered bug netting on the beds and house number 2 did not. The cockroaches are an easy inch and a half long by half an inch wide and….wait for it… THEY FLY!!! All of the lizards make this strange bird-like sound that any one who has heard it will tell you sounds an awful like like a high-pitched and drawn out, “fu** you.” But don’t let this deter you family friendly types as this nerve wracking noise is usually reserved for the middle of the night to break the unsuspecting silence. Nervous that we might bite off more than we could chew we were at least cognoscente of the fact that a month is a long time to stay put in one domicile so we broke it up and spent half of it in one home and the next half in the second location. Thankfully, the second host was willing to receive us early so we left the house of animals and electrocution almost a week early. A welcomed improvement with the second home was the air conditioner! Don’t let me lead you astray. This is by no means the United States. The homes inability to seal and the indoor-outdoor bathrooms that are combined to the main compartments of the home mean that your living space never really cools below an average 77 degrees which is some how a formidable reprieve from the wet hell fire that is the outside. All of the air conditioners used in town are the exact same. They only go as low at 18 degrees Celsius/64 degrees Fahrenheit which would be sufficient IF the machine were capable or blowing with more than 1 horsepower OR if the home didn’t have direct air vents, gaps and doors straight to the inferno of a 90 degree average temperature. But I digress, we welcomed the new internal average of 83 degrees at the second home and will leave you with this little travel hack and Must Know #4, Air conditioned Hotels are a once a week Must! But be warned because even this vacay from your vacay can be deceiving as everything in Bali seems to photograph well but only for that solitary shot. 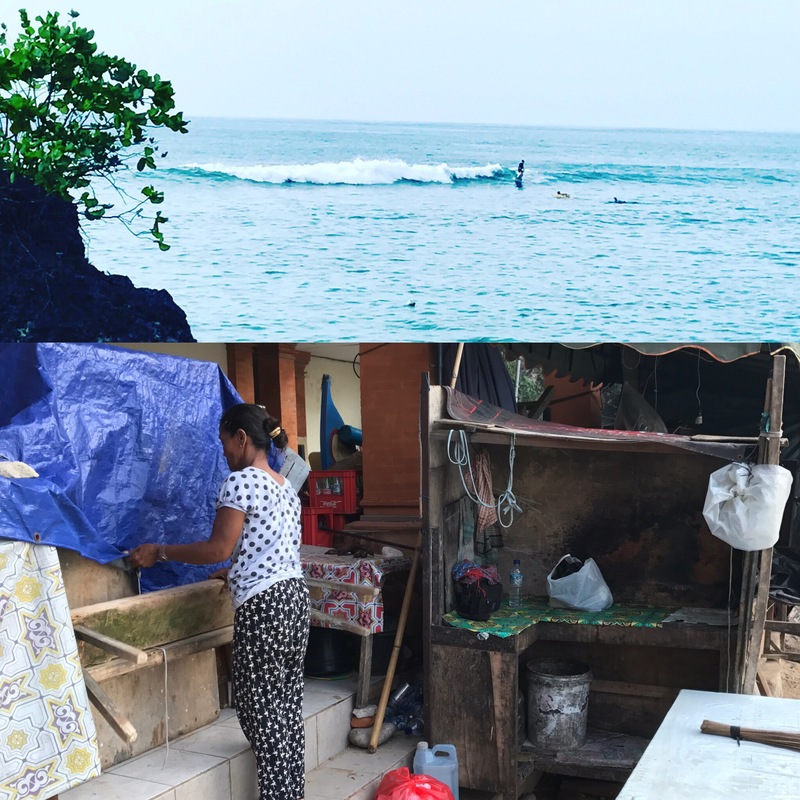 For instance, while Padang Padang Beach is known for surf and beautiful beaches you’ll note that everyone takes the exact same photo. Why is that you ask? 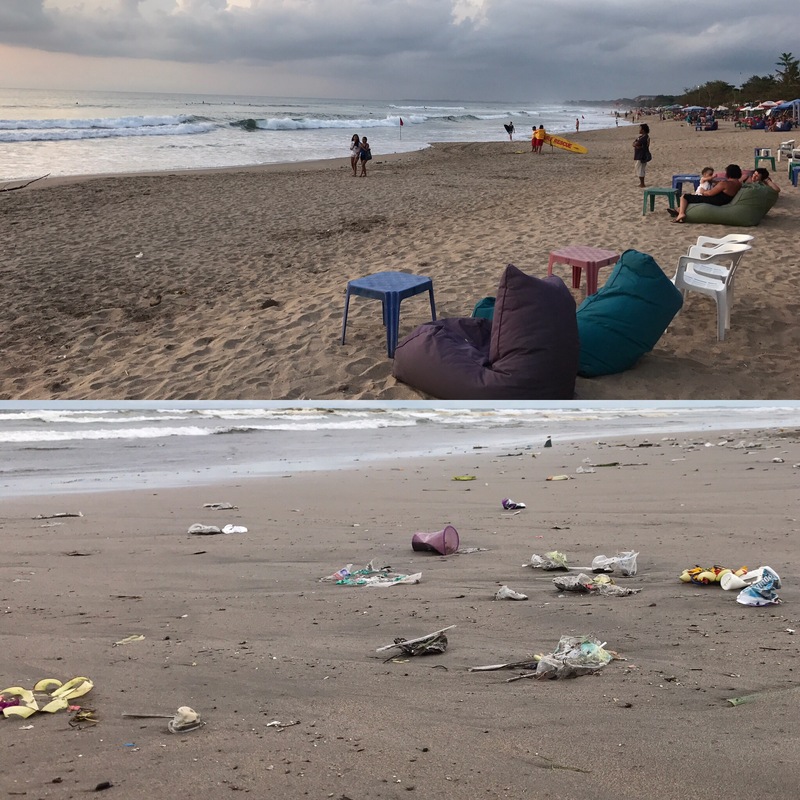 Because what you aren’t seeing are the miles of beaches covered in the locals trash or that the surfers are also literally swimming with hygienic waste. So, be prepared to see the snapshot you’re expecting but drag out your hazmat suits for maximum enjoyment. The lack of outside contact allowed for us… or rather forced us… to learn more about one another. Realizing that the “other friends” that you spend the majority of your time with are not only not there to grab a drink with but they are also not on the other side of the phone was a rough realization for both of us. We were essentially cut off from the equilibrium of our extended teams and thrown into a bubble together. This brings me to our Must Know #6: Know your travel companion. I am now a firm believer that you must unconditionally LOVE the person you are travelling with or you both have to have a will to compromise and a firm grip on the concept of semper gumbi (always flexible.) Luckily, we’ve got that. There have been maniacal highs and mutually certifiable lows but he and I are equally familiar with compromise and, dare I say it, I think that we may be coming to a reciprocal position of agreement with our new normal. I am a; lover, dreamer and a cuddle ninja with a zest for life, adventure and experience. He is a; loyal, realistic, cornerstone of a man with a zest for life, adventure and experience. We learned what we can and what we absolutely can not compromise on. We had our first real fight after a year of friendship….great news…we survived. And if this month was any indicator we will continue to survive and more than that THRIVE for a long time to come. Adam is the balance I knew he would be to me but he is also that small gentle nudge that I’ve been missing in my life. Must Know#7: Scooters are your friend. They are also the equivalent of a ticket to the Hunger Games. The streets in Bali are the carbon copy of an ill-paved bike lane in the States that you would question the width of but balls-up for because hell, it’s just a mountain bike. But it’s not just a mountain bike! It’s a motor scooter with all the maintenance qualities of a rental from a company that is on the run from government accountability. A car and scooter can not share the road, as there is not enough space, so whoever’s lane is majorly obstructed yields by parking on the side of the road and allowing the other driver right of passage. You drive on the left side of the road not the right. At least you are supposed to but the locals just drive wherever the hell they feel comfortable and make whatever lane available that they choose. No lane available? No worries! Just blow your horn and navigate to your destination by driving through the shop laden sidewalks. The pot holes can be the size of a small ditch which would be less concerning if you weren’t attempting to avoid the actual ditch or ravine to your immediate left. That ravine leads to most certain death as it falls dramatically into the abyss of the jungle with no verifiable base in sight. It is suggested upon rental that you avoid these pot holes or risk ruing the bike. The thing is with the amount of ferrel dogs, running the streets like unitimidated drug lords, being in the multiple dozens your options begin to limited themselves. The dogs here will actually settle in for a nap in the middle of the street lane knowing that the local traffic will just drive around them. These are just the highlights! I haven’t even scratched the surface of the elephants or monkeys in the middle of the road to avoid depending on your location. Or the fact that you can not park certain places or else the monkeys will vandalize your seat just to try and break in with the INTENTION of thieving you! So, there it is, your fair warning. Keep your friends close and your enemies closer relates directly to scooters in the heart of Indonesia. Must Know #8: There is no such thing as a vegetable. Despite what your parents may or may not have taught you there is actually no such thing as macro or micro nutrients what-so-ever. Okay, I may be over exaggerating just a bit but not by much. Searching out a vegetable, outside of a tomato, out here is a futile quest with better odds of finding the holy grail and eternal life. Need a vitamin or supplement? Go ask Alice. She has a better likelihood of finding you a pill then you do of finding a supplement in this country. For two adults who have learned to eat well and supplement every day, outside of week one, has felt like macro/micro torture to our bodies. We are both jonesing for a cleanse or fast at this point and not because we have feasted like kings on the garbage of gluttony but because we are relying on tomatoes and avocados for nutrients. Smoothies full of sugar, yogurt and avocado have become a staple. I’ve never been so thrilled to add avocado and banana to so many many things! This leads me to Must Know #9: The meat here is lean and not in the healthy way but in the lean pickings kind of way. They raise cattle (read that as a question,) goats and chickens. None of these animals ever get fat enough for the slaughter. Even the animals presented at Temple offering are malnourished and lacking effect. They are never provided for well enough to even make milk. The milk is imported in from Australia. The safest meat to order or buy at the super market is the chicken but even that has limited mass and a lot of undefinable skin or fat to cut away. BUT every meal that you eat in country WILL consist of meat and rice. Adam and I have each lost a respective 10 pounds and my working assumption is that it is all muscle due to lack of protein. If I gave you a travel hack to accompany this Must Know it would be to purchase a flat of eggs on arrival, they will go into every meal you eat. Bring lots of vitamins and supplements…..and maybe even a stool softener. Your colon will thank you. And for the Must Know we’ve all been waiting for….. Must Know #10: Your expedition for Whiskey is futile. I know! I can hear you through the computer, save the snark, it’s a wonder I made it. Seriously though, they can’t grow the ingredients to produce it and import costs are so high that on average you can find 2 types of whiskey; yuck and yuckier, and both cost you a month’s worth of salary. Don’t fret though. There are plenty of watered down Bud Light type of beers, look like a Hineken but called Bintang, that your grandpa drank to offset your desire for anything that would actually tantalize your taste buds. This isn’t really a terribly large problem though as there is only 1 place on the ENTIRE ISLAND that we could find to watch sports so the need for consumption dramatically decreased. Not to be dissuaded we assumed that this would inadvertently increase our water intake BUT the water here is not potable and you can only consume pre-bottled (relatively expensive) water. None the less it’s water or bust so we made it happen and if you’re coming to the equator of hell you should consider excessively increasing your aqua intake too. Lord knows the monkeys do. So, what are our takeaways? Ready to embrace life we jumped ship knowing a limited amount about one other and even less about our destination. This trip is a perfect example of our finite research due to impatience. Bali would have been an amazing one week stay. Hell, we probably couldn’t have fit all that we did or all that we wanted to do into just one week and we would have been pining after what we felt we had left inexperienced. But that wasn’t the case. We came. We saw. We conquered. We got complacent. It’s safe to glean that will not choose to expat here in beautiful and culturally rich Bali. We need to have more creature comforts of the First World and we’re not afraid to admit it. All that to say, throwing ourselves into this specific location was no mistake. It opened the doors to communication and made us a more functional team. It forced bonding for all four of us and we were able to really nail down some things we would change for the upcoming locations; creature comforts (internet availability, air conditioning, a blow dryer etc.) as one example. We will never book lodging unseen for over a week again. We will always have a flight in and never a flight out to allow for maximum flexibility. And we will ALWAYS check the weather projection for our upcoming destination. All in all Bali was incredible. Don’t let my diatribe fool you. I want to present you with an honest account of all things that we experienced. The truth is that our photo roll will often show you the glam while our blog lays down the value. Make sure you are following both so that you never end up with a one sided view of any place we adventure to. You can find us on Instagram at http://www.instagram.com/alphasoscarmike or at http://www.facebook.com/alphasoscarmike. We are already pleasantly surprised with people’s feedback and willingness to network for us. We have many future dates and places on the calendar with people and we are looking forward to meeting you or your suggestion contact on the road in the future. Please email all; suggestions, ideas, locations and meet requests to alphasoscarmike@gmail.com and we look forward to seeing you all out here!! Glad you weren’t the one in the newspaper headline! Love you! You and me both 😂 love and miss you! !